original title: Cry Freedom Fighters! Batman, Plastic Man and the Freedom Fighters go to a planet ruled by an oppressive dictator, who has designs on Earth. When they go there, they discover the inhabitants are too afraid to stand up to the dictator. And their lack of hope weakens, the Fighters' leader Uncle Sam. The team and Batman are captured. Plastic Man and Sam escape but he becomes so weak that he's fading away. So Plastic Man tries to rally the inhabitants hopefully it will rejuvenate Sam. When an alien race tries to invade Earth, Batman, Plastic Man and the Freedom Fighters race to their planet to stop them. 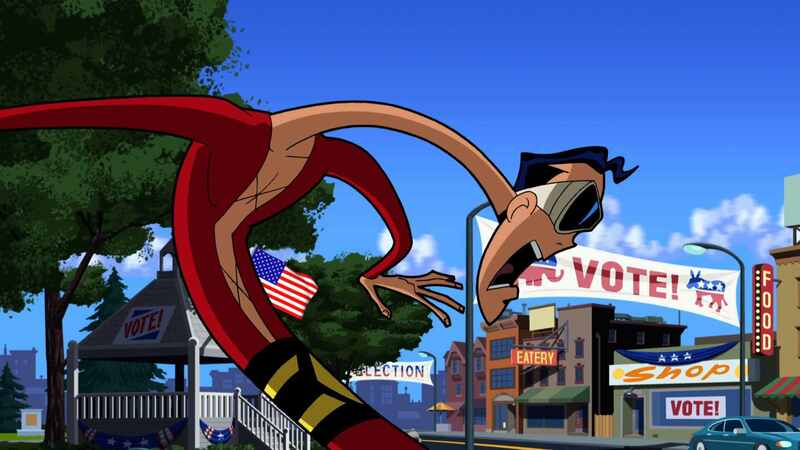 Thealien's numbers prove overwhelming and it falls on Plastic Man to find the patriotism within to stop them. All American EPISODE! A stunningly Patriotic Batman episode filled with quotes and ideals derived directly from the U.S. Constitution and early American history. This is a refreshing change to the usual, moral light cartoons found on the Cartoon network. The story focuses heavily on "freedom spirit that is all around us" in order to overcome the bad guys. While running the risk of being over the top cheesy, this episode of Batman teaches children some real American values. I found myself resisting the urge to cheer on the heroes along with my kids. This episode really stands out from the cartoon mud that permeates todays children programming. If nothing else, A+ to the writers for creating a fun filled patriotism lesson we can all learn from. GOOD JOB GUYS! More please.